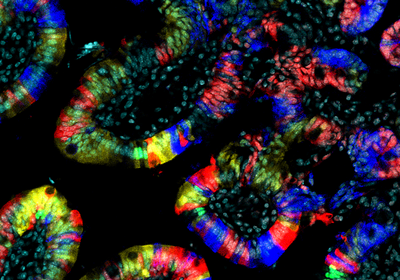 Immune cells in the mouse gut help recognize damaging compounds and prompt intestinal stem cells to repair DNA. 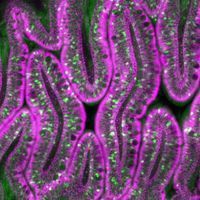 ABOVE: Fluorescent proteins attached to the intestinal cell wall reveal the cross section of a mouse’s intestine. If the epithelial cells lining the intestine rack up too many mutations, they can cause bowel cancer. A new study shows that immune cells in the mouse gut may help keep DNA damage in check to prevent the stem cells from becoming cancerous, researchers reported January 30 in Nature. In a mouse model, the paper’s authors showed that immune cells recognized compounds that could damage DNA. 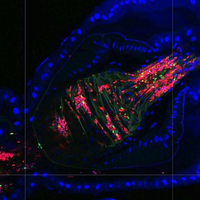 In response, the cells sent out a signal in the form of the protein interleukin-22 that prompted intestinal stem cells to ratchet up their DNA repair. 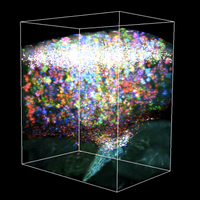 When the researchers turned off the immune sensing, they saw significant uptick in bowel cancer in the mice. 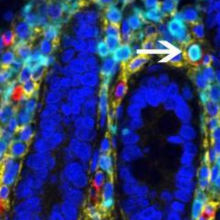 K. Gronke et al., “Interleukin-22 protects intestinal stem cells against genotoxic stress,” Nature, doi:10.1038/s41586-019-0899-7, 2019.